Synergys Biotherapeutics is a privately held antibody therapeutics company. Founded in 2010 in the San Francisco Bay Area, Synergys is developing multifunctional anti-vasculogenic antibody therapeutics primarily for cancer with potential future development in ocular and other angiogenesis-related diseases of significant unmet medical needs. The Company focuses on in-licensing early stage candidates from external sources for additional development by itself as well as by building partnership and collaboration with larger biotech and pharma companies. Synergys� most advanced product candidate is Anti-EGFR-ATAP where Anti-EGFR MAb is fused to endostatin-P125A as an ATAP (Antibody-Targeted Endostatin Payload). This is being developed as a targeted therapy for Triple-Negative Breast Cancer (TNBC) and other EGFR+ malignancies. Unlike ADCs (Antibody Drug Conjugates), which involves chemical conjugation of small molecule toxin drugs to antibodies with the help of linkers, ATAP is a fully biological payload that genetically fuses the highly efficient anti-angiogenic variant of endostatin, endostatin-P125A to an antibody such as Anti-EGFR. Our second candidate is a first-in-class fully human antibody against both angiopoietin-1 and angiopoietin-2, two highly prominent growth factors of the angiogenic pathway. This is being developed initially as an anti-cancer drug for pancreatic cancer. The management and advisory team members of the Company are veterans of antibody and cancer areas spanning almost 25 years of average experience covering technology and product development and business operations. Dr. Das has more than 30 years of experience in big pharma and biotech industry focusing on the biotherapeutics sector in general, and the therapeutic antibody area, in particular. Immediately prior to founding Synergys, he worked for 9 years for Affitech AS of Oslo, Norway, an antibody therapeutics company, of which he was the Senior Vice President of Corporate Development and Chief Business Officer and the President of its US operations, Affitech USA, Inc. As the CBO of Affitech, Dr. Das was instrumental in building the expanding commercial and licensing agreements of Affitech AS and was responsible for various aspects of the Company�s corporate development activities including the expansion and management of the US subsidiary. He also assisted at the highest management level in several external fundraising efforts of multimillion dollar total valuation for Affitech. Previously, Dr. Das has held research management positions as Section Head at Bayer Corporation in the United States and worked at Bayer AG in Germany in an executive exchange program. Besides having a PhD in Bioorganic Chemistry and an MBA(Executive Programme), Dr. Das carried out several years of post-doctoral research in cellular and molecular biology at the University of Iowa, Iowa City and at the Cancer Research Center, Massachussetts Institute of Technology, Cambridge, USA. He has published numerous articles in both peer-reviewed and trade journals and was a Contributing Editor of the American Biotechnology Laboratory, a biotech trade journal published by the International Scientific Communications. He co-edited a monograph on Membrane Proteins published by the Academic Press and authored or co-authored several D&MD market research reports on Phage Display, Antibody Engineering , and Antibody Therapeutics. 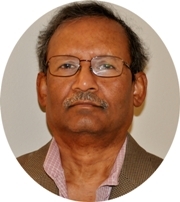 Dr. Das founded the Indiana Section of the Society of Industrial Microbiology, USA. CEOCFO: Mr. Das, what is the concept behind Synergys Biotherapeutics? Mr. Das: We are developing multi-functional anti-angiogenic antibody therapeutics. For diseases like cancer and inflammatory diseases, the blood supply is crucial. The whole process of formation of new blood vessels from pre-existing ones for facilitating supply of blood is called angiogenesis. The biopharmaceutical products that we are developing are anti-angiogenic or inhibitors of the formation of new blood vessels. CEOCFCO: How is what you are developing different from what might be available today? Mr. Das: Angiogenesis is a complex process, to say the least. It is complex in the sense that there are various factors and pathways involved in the whole process. What we are doing relative to other people is that we are trying to develop biopharmaceutical products, each of which will be able to inhibit more than one of these factors or pathways concomitantly. Currently marketed antibody product of Roche/Genentech called Avastin inhibits one particular growth factor called vascular endothelial growth factor. Our products currently under development are going to be multifunctional and as I mentioned, each will inhibit more than one pathway or factors. Mr. Das: Instead of using one antibody that targets one antigen, in one of our antibody products we have added a payload with anti-angiogenic function to that antibody. In other words, you could imagine that instead of having one warhead, we have two warheads in tandem with targeting capability, one of which will inhibit one cellular function, and the other would inhibit another functionality. Our second product candidate is an antibody that by itself targets two anti-angiogenic antigens. CEOCFO: What will be happening in the body? Mr. Das: In the body there are several growth factors which are responsible for the formation of new capillaries as conduits for the supply of blood to the site of tumors. Inhibiting some of these growth factors, especially the primary ones should choke off the blood supply and thus shrink tumors. Each of the currently marketed products inhibit one specific growth factor or pathway. Our antibody-based products are designed to inhibit more than one of these factors or pathways that are responsible for blood supply to the tumor and thus are expected to be more efficacious in inhibiting tumor growth than the currently marketed products. CEOCFO: Where are you in the development process? Mr. Das: As you know, drug development is a long-term effort. It requires a lot of money, and a lot of processes have to be taken care of before a drug can even undergo clinical Phase I. We are in the pre-clinical development stage. There are various processes we are running right now. On one hand, we are doing basic research with our candidates to understand better or expand on some of our current understanding of the biological processes involved in angiogenesis, and on the other hand, we are also trying to produce our candidate proteins in larger amount for facilitating various in vitro and in vivo studies. Our first product candidate, which is an antibody-payload fusion protein, has generated some very interesting results where we have seen already that it inhibits specifically at least two different functions that are involved in the overall process of angiogenesis and vasculogenesis. The antibody-payload also inhibits tumor growth in vivo in a Triple Negative Breast Cancer (TNBC) animal model. We are making this protein candidate from a cell line that could be used for final manufacturing processes. Our 2nd candidate has also shown significant tumor inhibition in both colorectal and pancreatic cancer animal models and inhibition of angiogenesis. CEOCFO: Would this work for all tumors? Mr. Das: Our candidates are mostly going to work for solid tumors, such as those that form tumor mass, e.g., breast, ovaries, colon, brain, pancreas etc. As I mentioned, our initial disease areas that we are working on right now with our antibody-payload candidate is triple negative breast cancer. We are concentrating on pancreatic cancer with our second candidate. Triple negative breast cancer is a terminal and terrible disease particularly affecting younger women and women of African-American origin. Ten to twenty percent of all breast cancer patients in the US are TNBC sufferers. Five year recurrence of the disease is over 30% and post recurrence survival is about 9 months. Pancreatic cancer is one of the nation�s deadliest cancers with a five-year relative survival rate of just 6 percent. An estimated 73 percent of patients will die in the first year of diagnosis. Naturally, being of significant unmet medical needs, as drug developer we are very compassionate about both TNBC and pancreatic cancer, although our first candidate assigned for development is the antibody-payload fusion for triple negative breast cancer. CEOCFO: Put it all together for our readers. There are so many companies doing research and so few dollars to go around. Why does Synergy Biotherapeutics shine? Why should the medical and investment communities pay attention? Mr. Das: We have been trying to generate finance for the company for quite a while. Unfortunately, we started the company at a time when there was tremendous economic downturn in the whole industry, and we have been quite early stage in our development process. The investment community generally likes to put money in those companies where they have progressed significantly into the later stages of development. So far, we have been moving primarily with the meager finance that we have available, and we are making our best efforts in VC solicitation for additional funding besides applying for governmental grants. In spite of our hardship, due to the quality and prospect of our programs, recently one of the country�s top-notch breast cancer clinicians from Stanford University has agreed to come onboard with us as one of our scientific board members, and an angel investor has joined the company also as a finance advisor. People are really looking at our programs, and they are getting more and more excited about what we have been able to accomplish so far in generating some exciting scientific results. Going back to your specific question as to why people should pay attention to us, I�d like to emphasize that there are several aspects of our company and our programs which are unique and have significant value-generation qualities that people need to look at. Being a small organization we are nimble. Our management and advisory board members are all industry veterans with significant experience and expertise in biopharma industry and cancer. And, our business model has been virtual thus far, thus saving a lot of cashburns but still generating exciting technical data primarily doing collaborative research with external partners. From a disease point of view, our focus has been in the TNBC and pancreatic cancers that have tremendous unmet medical needs and require more efficacious and safer drugs. The markets for such drugs are in multibillion dollars. Furthermore, even though we are early stage, however, we are among only a handful of global companies that are developing multifunctional anti-angiogenic antibody therapeutics for cancer. Particularly, our antibody-payload candidate not only inhibits angiogenesis, but it has also demonstrated profound inhibition of another function of the tumor pathway that has been shown to contribute to the development of cancer metastasis. These results provide a significant uniqueness to our candidate relative to the current antibody market product Avastin, which brings almost seven billion dollars in annual sales. Given these results, we are confident about establishing a new anti-vasculogenic treatment strategy for cancer that is distinct from the currently available drug, Avastin. And, as I mentioned already, this treatment strategy could potentially be tremendously valuable for treating highly aggressive metastatic cancers. Also, since the payload that we are using is a biological molecule that is genetically fused to the antibody, our antibody-payload system is a novel Antibody Biologic Construct (ABC) that is an alternative to the Antibody Drug Conjugates (ADC) which involves covalent conjugation of small molecule toxin drugs to antibodies for targeting tumors. We feel strongly that incorporation of multi-functionality into one single therapeutic candidate is a significant leap forward in the whole process of generating beneficial treatment for cancer.